It has been popular to ride an elephant while on an overseas holiday, but there is a heartbreaking reality behind this common bucket list activity. There are many animals being used as tourist attractions at overseas destinations. These tourist attractions include tiger petting, swimming with captive dolphins and watching dancing monkeys, but elephant rides seem to be the most popular of all these controversial tourist attractions. It is incredibly cruel to exploit animals for our entertainment because animals are often captured from the wild or bred into cruel confinement, and the methods of training wild animals often include being beaten or starved. Elephant rides have been popular among Australian tourists wanting to tick the activity off the bucket list or post a few photos on social media for everyone back home. It’s undoubtedly popular, with around 44% of Australians believing it’s okay to ride an elephant and according to a study, many Australian tourists have planned to ride an elephant at least once in their lives. 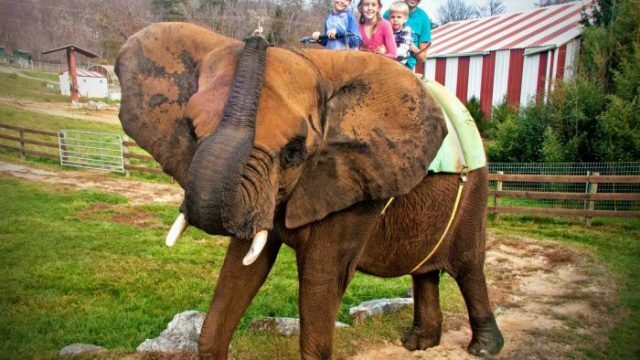 It shouldn’t be a surprise but elephants don’t naturally give people rides. However, it may surprise the public to know exactly why an elephant will submit to giving rides in places like Thailand and Bali. A baby elephant is first captured from the wild, taken from their family and then subjected to the “crush”, where they are held in an enclosed space and beaten until their “spirit is broken”. The elephants only obey the trainers because they fear being tortured and have a constant reminder because the trainers hold “bull hooks” in their hand. A bull hook is a wooden stick with a sharp hooked metal end that pierces through the elephant’s skin. The elephants are stabbed with the bull hooks throughout the elephant ride and the bull hook is completely visible to tourists, however the excitement of an elephant ride makes tourists turn a blind eye to the obvious suffering of the animal. It used to be popular in Australia to ride elephants at zoos and circuses but it has since been phased out. Zoos in Australia no longer force elephants to perform tricks or give rides. There are two circuses in Australia with wild animals, however there are no longer elephants involved. It’s bizarre that the practice is too cruel to occur in Australia, and yet Australians will go overseas for the experience. In recent years, there has been an increased backlash against elephant rides and performing wild animal performances. In 2017, social media giant Instagram placed warnings for animal cruelty on the hashtag #elephantride to educate its users that elephant rides are abusive forms of entertainment. There are thankfully a few elephant sanctuaries, however there are also many fraud sanctuaries that mislead people who are seeking a humane elephant experience. An elephant sanctuary will never force an animal to perform or allow tourists to ride an elephant. There should also never be elephants chained or trainers holding bull hooks at a genuine animal sanctuary. We don’t need to ride an elephant to be entertained and we shouldn’t ride an elephant because it’s senseless animal cruelty.